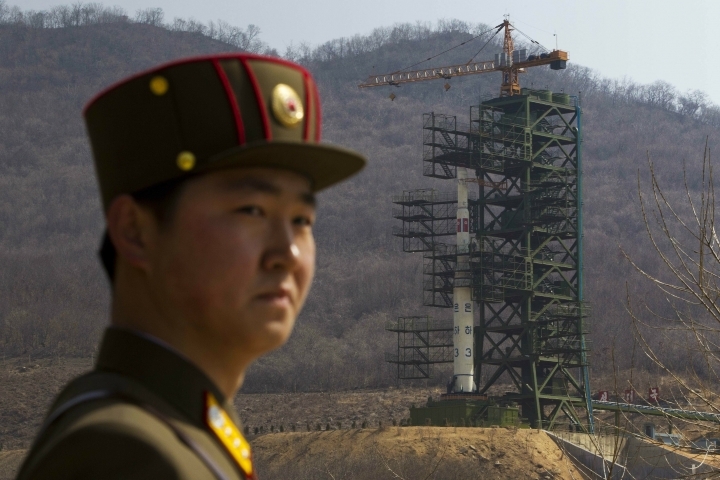 SEOUL, South Korea — U.S. analysts say North Korea appears to have restored normal operations at a long-range rocket launch site it had partially dismantled last year as part of disarmament steps. Some experts say North Korea is trying to convey displeasure over the breakdown of a high-stakes nuclear summit last week between leader Kim Jong Un and President Donald Trump over what the Americans said were Kim's excessive demands for sanctions relief. North Korea's state media on Friday acknowledged for the first time that the summit ended without an agreement. But the Rodong Sinmun, which primarily targets the domestic audience, held back from criticizing the United States and instead berated "detestable" Japan for supposedly celebrating the "unexpected" setback and supporting sanctions against the North. The United States and North Korea accused each other of causing the breakdown of the talks in Vietnam, but both sides left the door open for future negotiations. 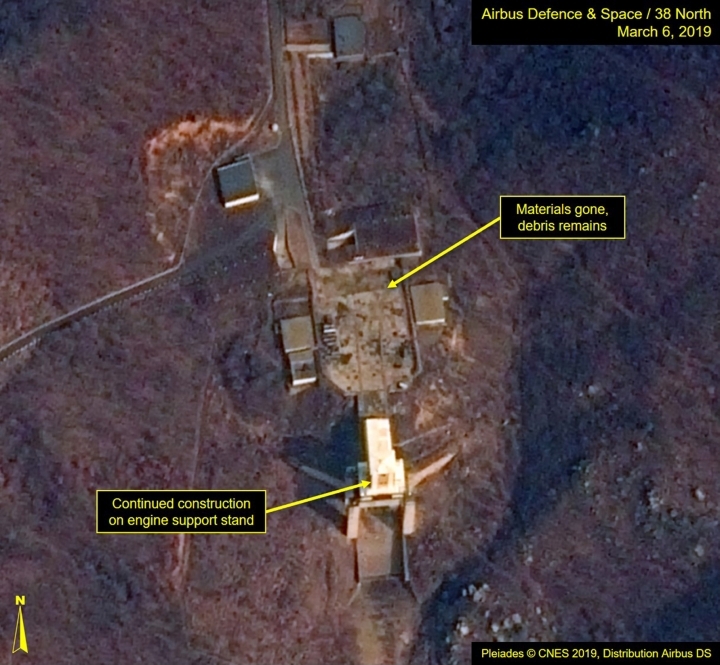 North Korea-focused website 38 North said Thursday that commercial satellite images from March 6 indicate that the launch site appears to have returned to "normal operational status" following rapid construction to rebuild a launch pad and a rocket engine test stand. The Washington-based Center for Strategic and International Studies published similar findings and said the North's actions amount to a "snapback" from the moderate dismantlement it undertook following the first Trump-Kim summit last June. "The rebuilding activities at Sohae demonstrate how quickly North Korea can easily render reversible any steps taken toward scrapping its WMD program with little hesitation," the CSIS said in a study authored by Joseph Bermudez and Victor Cha. "This poses challenges for the U.S. goal of final, irreversible and verifiable denuclearization." Trump said he's a "little disappointed" by the reports of the new North Korean activity and that time will tell if U.S. diplomacy with the reclusive country will be successful. The Sohae satellite launching center in Tongchang-ri, a seaside region in western North Korea, is where the North carried out satellite launches in recent years, resulting in U.N. sanctions over claims that they were disguised tests of banned missile technology. Some experts see the North as trying to put pressure on Washington and Seoul, which has acted as a mediator, to make a deal by creating an impression that it could resume missile or rocket tests. South Korea's spy agency has also told lawmakers in a closed-door intelligence briefing that increased vehicle movement was detected at a missile research center on the outskirts of Pyongyang where the North is believed to build long-range missiles targeting the U.S. mainland. South Korea's Defense Ministry said Thursday that it is carefully monitoring North Korean nuclear and missile facilities and that the U.S. and South Korean militaries were closely coordinating intelligence over the developments at Tongchang-ri and the missile research center. Moon Seong Mook, an analyst for the Seoul-based Korea Research Institute for National Strategy, said it's unlikely that North Korea will resume major missile tests or satellite launches anytime soon because that would risk destroying its fragile negotiations with Washington and could bring even harsher sanctions on its crippled economy. He said North Korea will also want to see if South Korea will support its position more strongly. Undeterred by the breakdown of the Trump-Kim summit, South Korea has continued to urge the United States to ease sanctions on North Korea to allow a resumption of inter-Korean economic projects and encourage more disarmament steps from the North. South Korean President Moon Jae-in, who has said it was Seoul's "outmost priority" to prevent nuclear negotiations between Washington and Pyongyang from derailing, nominated a dovish scholar as his new point-man on North Korea on Friday in an apparent effort to push further his engagement policy with the North. Kim Yeonchul, currently the head of the state-funded Korea Institute for National Unification, has been an outspoken supporter of inter-Korean rapprochement and frequently expressed skepticism on whether sanctions work with North Korea. The presidential Blue House described Kim as a leading expert in "inter-Korean economic cooperation and the North Korean nuclear problem." When asked about the prospects of restarting operations at an inter-Korean factory park in the North Korean border town of Kaesong and South Korean tours to the North's Diamond Mountain resort, Kim told reporters on Friday that Seoul should "work on it." South Korean calls for partial sanctions relief to encourage nuclear disarmament steps by North Korea has caused disagreements with Washington, which does not want to give up what it sees as its main leverage with the North. A senior State Department official told reporters on Thursday that Washington isn't considering sanctions exemptions for inter-Korean economic projects. Analyzing commercial satellite images from March 6, the CSIS report assessed that the North had completed rebuilding the superstructure and covering of the rocket engine test stand at the launch site. Additional work at the stand, such as the construction of a shelter on the entrance ramp, could indicate preparations to test rocket engines again, it said. The 38 North study said the North appears to have also finished rebuilding a rail-mounted transfer structure at the launch pad and that the structure may now be operational. The structure is used to move rocket stages from an underground transfer point to a processing building and from the processing building to the launch tower, according to CSIS, which provided a similar account on the developments. 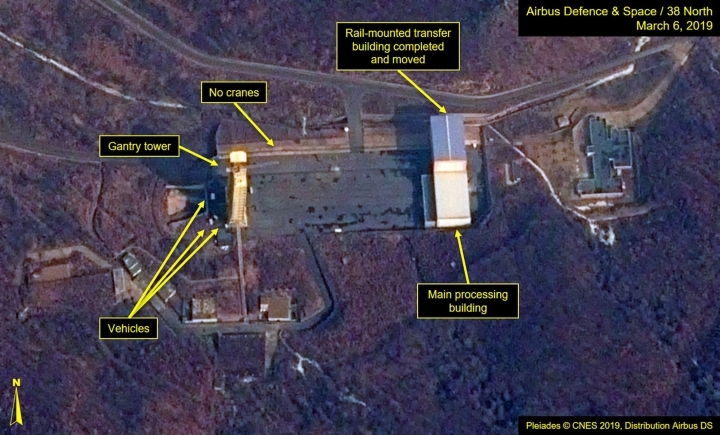 Satellite images taken weeks after the first Trump-Kim summit had shown the North was taking steps to dismantle the rocket engine test stand and the rail-mounted transfer structure at the launch pad.